We who speak for the vast majority of the Irish people, we who have risked a great deal to win the people to your side in this great crisis of your Empire’s history, we who have endeavoured, and successfully endeavoured to secure that the Irish in America shall not go into alliance with the Germans in that country – we, I think, were entitled to be consulted before this bloody course of executions was entered upon in Ireland. The government has come to the conclusion that the system under which Ireland has been governed has completely broken down. The only satisfactory alternative, in their judgement, is the creation, at the earliest possible moment, of an Irish Government responsible to the Irish people. I was in Dublin for two or three days last week, and the Southerners I met are all convinced that there will be another rebellion whether the Lloyd George terms are accepted or not. The fact that these terms were accepted has enormously strengthened the Sinn Feiners in the country. The acceptance of these suggestions by the Ulster Unionists has not had much effect on this part of the question. The Unionists’ acceptance under protest has increased Redmond’s difficulties, and, as we are given to believe, placed us in the position in the eyes of British public opinion of being reasonable people. If Redmond actually forms a government and tries to rule this country, the rebellion will be directed against him; if he does not, it will be directed against the existing government; in any case, the country will have to be more or less conquered outside the six counties, and that may possibly be the best way out of all our troubles, which have all their root in a British Prime Minister having brought in a Home Rule Bill. To try to find a solution of a moderate nature, a Convention was called for 1917. Its meetings were boycotted by both organised labour and Sinn Fein, and any attempt at a solution was blocked by in the conference chamber by the total refusal of the Ulster Unionists to consider the possibility of Home Rule for the whole of Ireland. This meant that partition was now the only possible solution, leading to all the problems which were still apparent in the the 1990s, before the Good Friday Agreement of 10 April 1998. On the 1 July the battle of the Somme opened, and the 36th (Ulster) Division was ordered out of their section of the British lines at Thiepval Wood on the River Ancre to attack the German lines. They attacked with tremendous courage… and in two days of battle… ended more or less where they had begun, in terms of ground gained. But their dead were heaped in thousands on the German wire and littered the ground that had been bitterly gained and bitterly lost: half of Ulster was in mourning. Above: Soldiers at the Western Front, waiting to ‘go over the top’. Above: Soldiers at the front in Gallipoli, 1915. With a shroud of the foggy dew. Source: Richard Brown and Christopher Daniels (1982), Documents and Debates: Twentieth Century Britain. Basingstoke: Macmillan Education. BEATING THE BOUNDS; SCANNING THE SKIES? The ‘Rogation Days‘ are the days before Ascension Thursday, which is forty days after Easter Sunday in the Christian calendar. The days get their name from the Latin word ’rogare’ meaning ’to ask for’. For a long time these were ’petitions’ to the almighty which were chanted in processions around the church. In A.D. 511 the Council of Orleans declared that the three days before Ascension Day, commemorating Christ’s going up to heaven, should be holidays for prayer and fasting. The processions moved outside the church and circled the parish, pausing at the edge of fields where prayers were said petitioning for a good harvest of the particular crop growing there. These sojourns included a ’Gospel Oak’. A modern survival of these folk-customs is ’beating the bounds’, possibly originating in pagan Roman festivals, Terminalia and Ambarvalia. The statue of Terminus was not int he form of a man, but a wooden post or boundary stone, marking the end of one estate and the beginning of another. From this, we get the idea of the end of a bus or rail route as a terminus. Ambarvalia, held at the same time of year, involved processions around the fields, with participants carrying sticks with which they beat the ground in order to drive away the winter frosts. Any grower will tell you that a late frost is very dangerous to the prospect of a good crop, especially if it comes after a prolonged spell of warm weather. At ’Rogationtide’, a procession forms up at the church with the priest in charge at the front followed by someone bearing the ceremonial cross. The choir follows, dressed in their gowns and surplices, and a crowd of parishioners, including schoolboys with their masters. Most of them carry willow wands, topped with wild flowers. They stop at well-known ’landmarks’ around the route following the parish boundary, perhaps a gate, a tree, a bridge or a road crossing, so that the company can gather round for prayers asking for seasonable weather and a successful harvest. At some of these points refreshments will be waiting. At the ’Gospel Oak’, or some other prominent landmark, the wand bearers used to set about beating the landmark, then transferred their wand-action to one of the boys, who was rolled in the grass or ’gently bumped’ against a tree, receiving compensation in silver for his ’suffering’. Since accurate mapping is a comparatively recent development, this was a sensible way of marking boundaries between parishes, especially before the early twentieth century, when the parishes played a vital role in the administration of the Poor Law and other local ’secular’services. In England and Wales, the Parish Council is still the basic unit of local government. If there was a dispute between parishes as to where the exact boundaries lay, somebody could be found who would remember a particular landmark from having received a beating there. In the late twentieth century the custom revived somewhat despite the national government taking over welfare services, and especially in urban areas where the boundaries might pass beside, or even through, a number of public houses, breweries and other places of interest forming ’recent’ additions to the townscape! At St Clement Danes in London, the procession of clergy and choir follows the beadle, an officer from medieval times, featured in Dickens’ Oliver Twist, who was responsible for ratepayers’ meetings which were held in the ’vestry’ of the Church. The Beadle was also responsible for the relief and discipline of the Poor in the parish, especially the children in church. For this purpose, he carried a stick called a mace, and wore a blue uniform cloak. At the St Clement Danes procession, the choirboys follow his now ceremonial mace, themselves carrying willow wands topped with ribbons or flowers. With these, they beat the boundary stones, although the southern boundary lies along the bed of the Thames, for which the procession takes to boats. Ascension Day, on the Thursday, is the day on which we think about Jesus being ’taken up’ to heaven from Bethany, as Luke describes in both his gospel (chapter 24) and in The Acts of the Apostles (chapter 1, vv 9-11). Having witnessed this, he tells us, they spent all their days in the Temple, worshipping and waiting for the gift of the Spirit to come to them before starting their ministry. In Acts, he tells us that, as they watched him, ’a cloud hid him from their sight’. They still had their eyes fixed on the sky when two ’men in white’ appeared beside them and asked them why, as practical Galilean fishermen and farmers, they were stood there ’star-gazing’. So, in addition to praying, they set about other practical preparations for ministry, together with the women and the family of Jesus. Already a hundred strong, the believers meet together and a successor to Judas is chosen. This was an important appointment, as Judas had been the group’s Treasurer. After that, Luke moves on quickly to the dramatic events of Pentecost. So, even during this quiet period of prayer and refection at Ascentiontide, like the disciples, we cannot afford to be ’so heavenly-minded’ that we are ’no earthly use’. Heaven may be a beautiful place, and we know that we too have a place there, but, for now, we need to focus on the here and now. We won’t need to strain our eyes, scanning the skies for signs of Jesus’ second coming, as with his first. It will be as clear and ’transparent’ an event as when he left. For this reason, Christianity has often been described as ’the most materialistic of all world religions’. a new Sepulchre, well gilt with gold, an image of God rising from the sepulchre; Heaven, made of timber and dyed cloth; Hell, made of wood and iron; four pairs of Angel’s wings of well painted wood; the Holy Ghost coming out of Heaven into the Sepulchre’. In some churches, the Paschal Candle forms a focal point, with its five grains of incense inserted in the form of a cross. It is lit at midnight as Easter Day begins, and remains lit until the Ascension, reminding us of the period the Risen Lord spent on earth, revealing himself to his disciples in various metaphysical form to his disciples, as referred to by Paul. 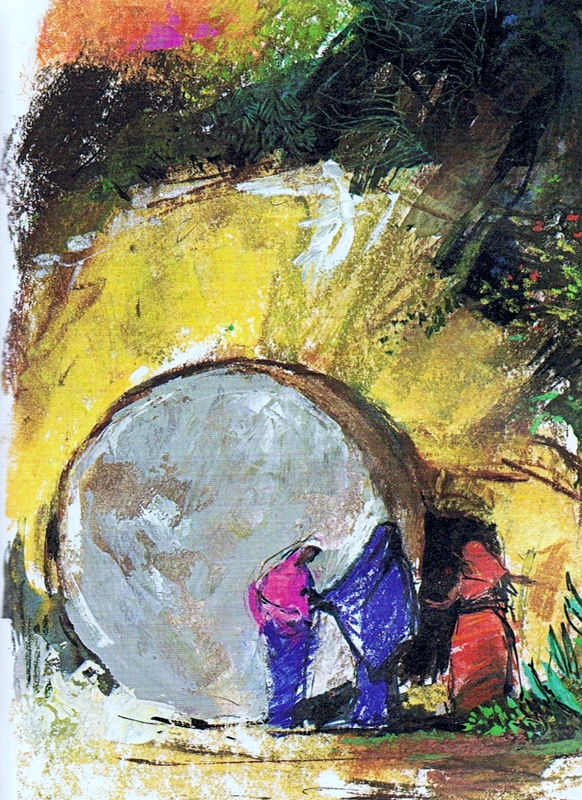 It’s generally accepted that Mary Magdalene entered the garden containing the tomb and made the first encounter with the risen Lord ‘at the rising of the sun’, and it was common at one time for people to get out into the fields at dawn and greet the sunrise from the top of a nearby mound, such as the Wrekin in Shropshire. So, at Easter, we don’t go ‘all round the Wrekin’, as the Black Country saying goes, describing the way the lengths some people go to avoid confronting the truth. 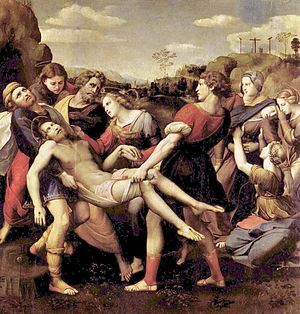 The challenge of the central truth of our faith, the Resurrection, needs to be met head-on. ‘When the Holy Day of the Jews was over, three women friends of Jesus – Mary of Magdala, Mary who was James’ mother, and Salome, brought sweet-smelling oils to anoint his body. They got to his grave very early on Sunday, just as the sun was rising. “Who will roll away the stone from the cave’s mouth for us?” they said to one another. It was a very big stone. They looked up and saw that it had already been rolled away. 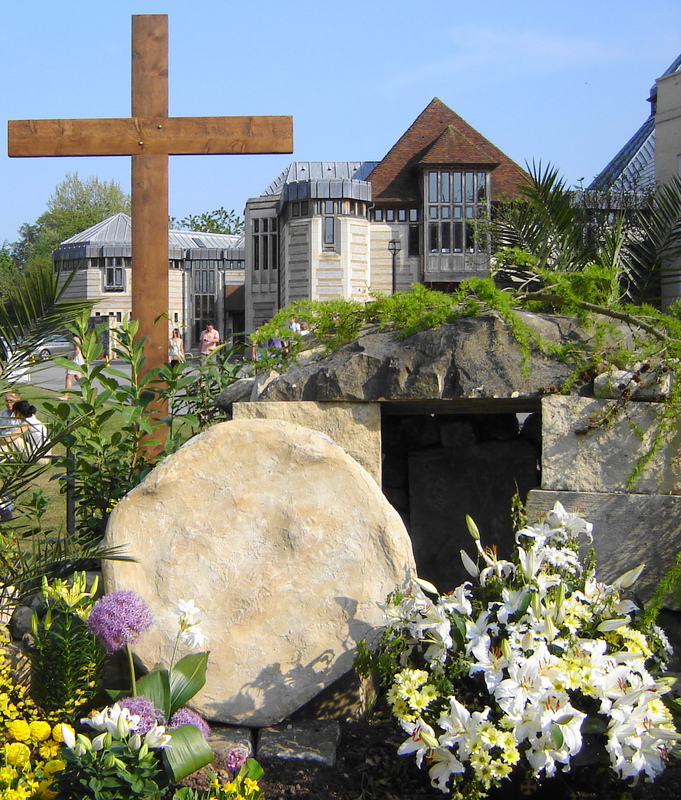 It is important to remember that it was not the empty tomb that convinced his friends that Jesus had been ‘raised from death’ but the new experience of God which Jesus made possible. What they believed God had done was the ground of their conviction. The empty tomb, by itself, doesn’t prove anything. It looks as if these first friends had their hands on an early report that they didn’t know what to do with, and there is no reason to doubt that the women among them found the tomb empty, as Jewish scholars also confirm, and that they were certain that it was the tomb in which they had seen Joseph of Arimathea and Nicodemus place the body the evening before. But the convincing evidence, as Paul saw and stated, was the fresh experience of God which changed the whole way in which the friends of Jesus lived and thought, and which made them new men and women. This fresh experience of the risen Christ is something which his millions of followers can now share this day and on every day. Each one experiences the Resurrection in his own way, but it is also a common experience which binds Christians together and which they pass on from generation to generation, from regeneration to regeneration, as in Baptism we die with Him and are raised with Him to immortal life. ‘Early in the morning, the Jewish Council talked over what they should do with Jesus. They handcuffed him and took him off and handed him over to Pilate, the Roman Governor. They brought the charge against him. “Haven’t you got anything to say?” asked Pilate. “See the charges they are making against you.” But Jesus had nothing more to say. Pilate was very surprised. He wanted to put the mob in a good mood, so het set Barabbas free and had Jesus flogged. Then he handed him over to the soldiers to be put to death on a cross. ‘Simon, whose home was in North Africa, was coming into the city from the country at the time. The soldiers made him carry the wooden cross and marched Jesus to Skull Hill. They offered him drugs to deaden the pain, but he didn’t take them. They nailed him to the cross and tossed up for his clothes and shared them out among themselves. ‘It was now three o’clock in the afternoon. “Eloi, Eloi, lema sabachthani? My God, my God why have you abandoned me?” Jesus called out loudly (The words are the words of an old Bible hymn)…One of them ran and filled a sponge with sour wine and put it on the end of a cane and tried to make Jesus drink it. What we need to remember is that is not a piece of historical writing. It is part of an act of worship, a celebration. When they repeated it, Jesus’ friends were thinking of the greatness of God’s love which Jesus’ death had made real for them. The details of what happened vary in the accounts of the gospel-writers because they were writing for different ‘congregations’ and never intended to give a detailed account of what happened, since they thought the event would remain in living memory, and all that was needed was a reminder of Jesus’ sacrifice each time they met. They expected their world to end soon with the return of the resurrected Jesus. When these accounts were written down there were misunderstandings and bitterness between the Jewish and Christian communities. 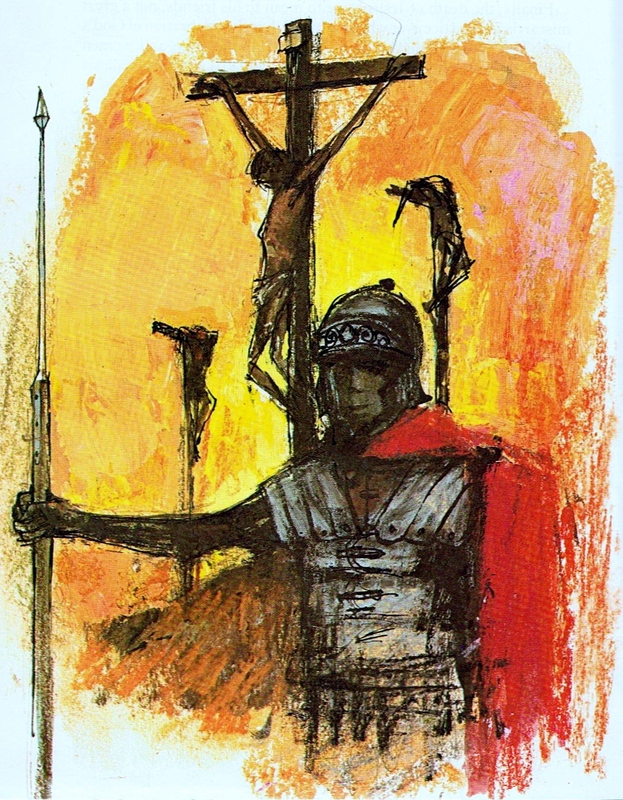 They therefore tend to emphasise the Jewish part in Jesus’ death, especially that of ‘the mob’ and the Temple authorities, and to underestimate the role of the Roman governor, Pilate. There is no doubt that he took the final decision; he could not have done otherwise. Any suggestion of a threat to Roman peace, especially in the crowded Jerusalem of the ‘High Festival’, Pesach, would force a governor worth his salt from Caesar to act quickly. The fact that some of Jesus’ supporters were armed would, on its own, give him the basis for Jesus’ execution as ‘The King of the Jews’, the words of the charge he had pinned to the cross and which he refused to alter. Besides, the death of Jesus came to mean something very special to his friends. Not a desperate defeat resulting from a huge miscarriage of justice over which to remain bitter and brood, but a celebration of God’s love. This was how far Jesus’ love for humanity took him. His resolution to live according to God’s will and in his way, and to share that with his people, took him to the cross. He could have escaped at any point, but didn’t try to. Of course it was a dark day, in every sense, but the Christian knows that without its events there would have been no Easter Sunday. 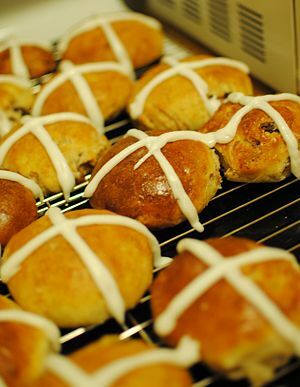 For many British people, the most pleasant memory associated with the day is eating hot cross buns which were once sold from house to house by street vendors who cried ‘one-a-penny; two-a-penny; hot cross buns’. This is a seemingly trivial reminder of the fate of Jesus, and is, in fact, yet another example of the grafting of a Christian tradition onto an older pagan one. Two loaves, each marked with a cross, were found among the ashes of Herculaneum, destroyed in A.D. 75, and it is unlikely that they were made for a Christian, especially since at that time the more universally accepted symbol for the nascent religion was the sign of the fish. The Greeks also marked cakes like this, and the Anglo-Saxons made small cakes marked with a cross at the Spring festival held in honour of Diana. From early Roman times right the way through to the Saxon invasions, altars to Diana were raised at crossroads, and traders sold refreshments, including ‘cross buns’. The famous Banbury ‘cross’ of another nursery rhyme is a market place at the junction of two ancient roads, such as those that sprang up in market towns throughout the Cotswolds as the wool and textile trades developed. ‘Let us pray for all those who want to repent and begin a new life, but who feel that it is too late…And let us, as one with the thief, pray as he did: ‘Lord remember me’. So may our last hour blend into light of paradise, through the power of the crucified. ‘Let us pray for all who suffer physical distress through lack of food and water…And let us pray for all who hunger and thirst after righteousness; that in their obedience to Christ they might have meat to eat unknown to them before and, according to Christ’s promise, be satisfied. ‘Let us pray for family ties. Let us pray for the bereaved; let us pray that Christ may create relationships which survive the worst blows which life can give. And let us thank him for his power in creating new relationships which sustain us in the different stages of our pilgrimage. ‘Let us pray for all who are abandoned; for nations…for children…for old people…for captives…who are abandoned…and for ourselves when we feel ourselves to be abandoned…May we learn to say “I shall yet give thanks unto him who is my Saviour, my King and my God”. ‘Let us thank Christ for finishing the work that he came to do; let us thank him for doing everything that is necessary for our salvation…to end our search for forgiveness…for pardon. And let us thank God that with the end of our search there is the beginning of a life of thankfulness, praise and service, offered to God not from fear but out of love. And let us pray that we may find the work he has for us to do, and finish it. ‘Let us thank God that when the conscious control of our life is beyond our grasp we may still repose upon God’s eternal changelessness…that in death our lives pass into the hands which made the world, and guide the universe. And may we place our lives in those hands while life is strong and full and sweet. Good Friday has become a fashionable day on which to perform what are known as Passion Plays, re-enacting the events of the last week of Christ’s life. The most famous of these is performed at Oberammergau in memory of a time when the village survived a great plague which swept across Germany. The people perform the play every ten years, usually in the summer when more people can see it. Some 400 performers take part in a vast theatre with an open-air stage which holds 5,000 people, and the play lasts nearly five hours. It is accompanied by a symphony orchestra and a choir. A hundred performances are given of what has become a vast commercial enterprise, but also remains a sincere, unique and moving experience. ‘The History of Seven Champions of Christendom’. Seven is, of course, the number of perfection in the Bible, while thirteen, the number of people at the Last Supper, including Judas, is considered ‘unlucky’ by more superstitious Christians, who think that Friday 13th is doubly unlucky, since Jesus was crucified on a Friday. However, there’s no need to ‘touch wood’ (i.e. the cross), because we are assured of the Resurrection on Sunday. Unlike ‘doubting’ Thomas, we don’t need to see and touch the wounds of the crucified and risen Christ to celebrate that as another historical fact. Nor do we need to establish the authenticity of the Turin shroud to prove this fact, though it’s interesting to read that scientists no longer think it is a Medieval fake. 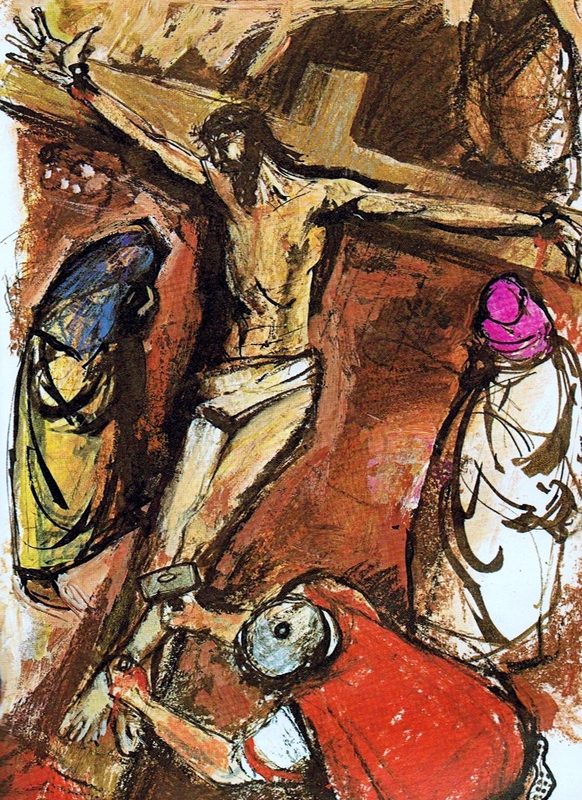 We may lack more than the simple chronicles of the events of Good Friday contained in the four gospels, but these chronicles mean that the passion of Christ, interpreted in various forms of art down the century, also remain indisputable facts. There is no fiction in the crucifixion of Christ, we know that he died on the cross and that Joseph of Arimathea wrapped his body in a linen sheet and laid it in a cave he himself had cut out of the rock, with a heavy stone rolled against the mouth. The Jewish historians also wrote of Jesus’ crucifixion. These facts are the bedrock of the Christian witness and the chronicles from which they come are not ‘shrouded from history’. The 12th February this year is ‘Shrove Tuesday‘. It can’t be fixed as a date on the calendar because Easter Sunday is decided according to the Jewish Feast of the Passover and the sacrifice of the Paschal lamb. This is determined by the full moon, so Easter may fall on any date between March 22nd and April 25th. So Lent, or Shrovetide, is variable to the same extent. The penitential season of Lent lasts forty days, not counting Sundays, its length connected to the days spent in the wilderness by Jesus in preparation for his ministry. The Anglo-Saxon word, ‘scrifan’ meant to impose a penance on oneself, and this gives us the verb ‘to shrive’ and the past tense of this yields the adjective ‘Shrove’ for the festival on the eve of Lent. The housewife used up all the meats that were not to be eaten during Lent on the Monday, and on the Tuesday the ‘larder’ had to be cleared of all fats and creams. Traditionally, these were put into pancakes, the eating of which was accompanied by all kinds of games and festivities, many of which survive as communal activities, including village football matches and tugs-of-war. In France, this is ‘Mardi-Gras’, Fat Tuesday; in Germany, ‘Fastendiensteg’; in Hungary, ‘last meat day’. In England, the festival is celebrated in Ashbourne in Derbyshire by a rather violent form of mass football between Uptown and Downtown, which lasts all day. Anyone can join in, and the shop-fronts in the High Streets are boarded up as it usually gets out of hand. 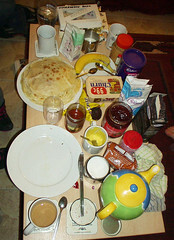 There are also various pancake races, involving the ‘tossing’ of the pancake. 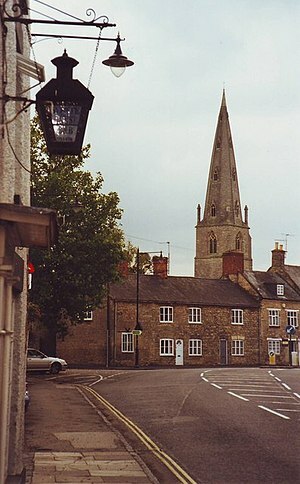 The race at Olney in Buckinghamshire is open to women over 18 who have lived in the village for at least three months. Each competitor wears an apron and bonnet to run from the market square to the church, about a quarter-mile (400 metres) with a pan holding a pancake which must be tossed three times. The winner receives the dubious honour of being kissed by the verger as well as a prayer-book, which the runner-up also gets. The event goes back four centuries to a moment when a housewife, hearing the church bells telling her she was late for worship, rushed off still holding the pan she was cooking pancakes in. ‘Shrove Tuesday’ can’t be fixed as a date on the calendar because Easter Sunday is decided according to the Jewish Feast of the Passover and the sacrifice of the Paschal lamb. This is determined by the full moon, so Easter may fall on any date between March 22nd and April 25th. So Lent, or Shrovetide, is variable to the same extent. The penitential season of Lent lasts forty days, not counting Sundays, its length connected to the days spent in the wilderness by Jesus in preparation for his ministry. The Anglo-Saxon word, ‘scrifan’ meant to impose a penance on oneself, and this gives us the verb ‘to shrive’ and the past tense of this yields the adjective ‘Shrove’ for the festival on the eve of Lent. The housewife used up all the meats that were not to be eaten during Lent on the Monday, and on the Tuesday the ‘larder’ had to be cleared of all fats and creams. Traditionally, these were put into pancakes, the eating of which was accompanied by all kinds of games and festivities, many of which survive as communal activities, including village football matches and tugs-of-war. In France, this is ‘Mardi-Gras’, Fat Tuesday; in Germany, ‘Fastendiensteg’; in Hungary, ‘last meat day’. In England, the festival is celebrated in Ashbourne in Derbyshire by a rather violent form of mass football between Uptown and Downtown, which lasts all day. Anyone can join in, and the shop-fronts in the High Streets are boarded up as it usually gets out of hand. There are also various pancake races, involving the ‘tossing’ of the pancake. The race at Olney in Buckinghamshire is open to women aged eighteen and over who have lived in the village for at least three months. Each competitor wears an apron and bonnet to run from the market square to the church, about a quarter-mile (400 metres) with a pan holding a pancake which must be tossed three times. The winner is kissed by the verger and receives a prayer-book, which the runner-up also gets. The event goes back four centuries to a moment when a housewife, hearing the church bells telling her she was late for worship, rushed off still holding the pan she was cooking pancakes in. After the fun of Shrove Tuesday, the solemn season of Lent begins with Ash Wednesday. The medieval church had strict rules about fasting and penitence which have changed over time and generally become more relaxed, even for the Catholic priests. My father-in-law was an incense-bearer as a young boy in Hungary and was sent on an errand to the priest’s house during Lent. When he entered he found the priest eating meat, and after that he fell out of love with the church. This was long before Hungary became a Soviet-controlled country. The Hungarian word for Shrove Tuesday, ‘meat-leaving’ shows that at one time no meat could be eaten on Wednesdays and Fridays during Lent, so this priest was guilty of hypocrisy in the eyes of my father-in-law, who, as an impressionable young boy, expected him to be a better role-model. However, fish could be eaten, as it traditionally was on Fridays throughout the year, so the Fishmongers did a good trade, not just in Dublin’s fair city, but in every Catholic country. That’s why every monastery kept its fish-pond and in Britain, a sea-going nation, cod ‘n’ chips or haddock ‘n’ chips is still a traditional family Friday feast. Many school canteens in Britain still serve fish only on Friday lunch-times, including the International College I worked for last there. It proved very popular with the largely British staff and international students alike, especially since our Spanish chef was such an expert on preparing various fish dishes. However, these rules are no longer so commonly observed in the Anglican and Nonconformist communities, where the emphasis on reflection and meditation is more important than the outward signs, and Lent is seen as a time for a renewal of faith and self-examination in matters of caring for others and missed opportunities. As a Quaker friend wrote to me yesterday, what matters most in the current debate on the role of religion in national life in Britain, is that people of all beliefs, whether professing a faith, or calling themselves ‘humanist’, ‘secularist’ or ‘atheist’, should dig deeper than a ‘shallow materialism’ to examine their consciences. Remember, man, thou art dust and unto dust shalt thou return. If the EU regulations on fishing are the object of hatred by British fishermen today, the fasting regulations imposed by Parliament in 1562 were certainly advantagous for them. Lord Cecil, Elizabeth’s Chief Minister, persuaded it to pass a ‘politic ordinance on fish eating’ which made meat-eating on a fast day punishable by a fine of three pounds or three months’ imprisonment. Puritans avoided fish diets on principle as a result, as a protest against the ‘superfluous feasting, or gormondizing, or paunch-cramming’ which went on at ‘festivals’. Perhaps this is where the doctrine of ‘everything in moderation’ comes from! In the end, the interests of both the fishermen and the ‘hard-pressed’ congregations were met by allowing a ‘let-up’ in the middle of Lent, through the institution of Refreshment Sunday, or Mothering Sunday. This is not to be confused with the American ‘Mother’s Day’ which is fixed in the USA as the second Sunday in May. More on this next week….